Never have their been more unlikely popstars than the Proclaimers, the bespectacled ginger twins from Auchtermuchty whose genial blend of Scottish country pop has made them beloved across the world, and whose most famous hit, the unofficial Scottish national anthem '500 Miles', plays as the opening credits to Benny & Joon roll. And never has there been a more unlikely romance than that which blossoms between fragile, mentally ill twentysomething Joon (Mary Stuart Masterson) and sweet natured innocent Sam (Johnny Depp), a charming misfit with learning difficulties and a chronic obsession with old movies. Joon's brother Benny (Aidan Quinn) has devoted his life to caring for his unstable sister, and as a result, like Gilbert Grape, he has no life of his own. But just as he's starting to feel he really can't cope any longer and is steeling himself to placing Joon in a home, along comes Sam, like a ray of quirky sunshine in a battered Buster Keaton hat and high-waisted Charlie Chaplin trousers. Forced to take this silent, smiling stranger home after losing a poker game, neither brother nor sister are at first terribly impressed. It doesn't take Sam long to win Joon over, however (he is, after all, nearly as nutty as she is) while Benny is just happy to find someone who likes housework - even if Sam does attack the chores with his own unique slant (you have to love the way he makes cheese toasties and mashes potatoes). But big bruv is not so happy when he realises that the eccentric pair have fallen in love, and his anger sets off a chain of events that can either end in happiness or disaster. And if you don't know which then I'll leave it to you to watch this charming, utterly delightful film and find out for yourself. Benny & Joon could easily have turned into a soppy romantic comedy about lovable crazy people and the mad things they get up to, but the sharp script and excellent performances transform the slight story into something much more honest, touching and thought provoking. Mary Stuart Masterson gives a real edgy depth to the character of Joon, portraying her as intelligent, creative and sharp ('Don't underestimate the mentally ill,' she snaps, 'we can count'), whilst, with his big hurt eyes and floppy hair, Johnny is at his oddball, offbeat best as her kindred spirit, the gentle, warmhearted Sam, mastering to perfection the comedy routines of his silent movie heroes and really lighting up the screen with his joyful persona. Aidan Quinn has the hard job as the straight man, but manages to convey well just how damned hard it is to be a carer, caught in a cycle of interdependency and torn between love and guilt, joy and grief, protectiveness and frustration, but in the end just trying to do the right thing. Veering between the laugh out loud funny and the tearjerkingly sad, Benny & Joon treads the fine line between comedy and tragedy, romance and sentiment with the grace, finesse and humour of one of Sam's beloved silent movie stars, balancing perfectly without ever wobbling into slushiness or melodrama. 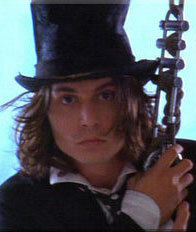 Delightful, heart warming and marvellously life affirming, Benny & Joon is a film that gives hope to us all. No matter how different, 'special' or odd you are, the perfect match is out there somewhere. No matter how hopeless things may seem, there's always something unexpected and beautiful just around the corner to make your day. Sadly, for most of us it isn't Johnny Depp in a funny hat. But then, like Benny, Joon and Sam, we can always dream.